My Categories: Autistic Spectrum Disorders, Educational Psychology, Special Educational Needs. 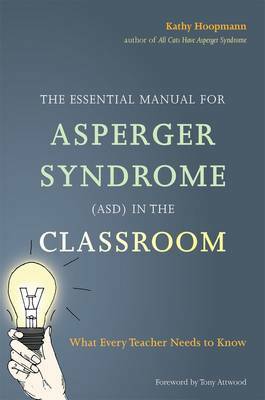 Perfect for time-poor teachers, Kathy Hoopmann’s essential handbook is an easy-to-navigate resource that promotes a positive learning environment in which students with Asperger syndrome (ASD) can thrive. Kathy’s unique ability to explain the ASD mind-set shines through as her concise descriptions reveal how to recognise and develop the child’s strengths to the fullest potential whilst guiding and mentoring through areas of difficulties. Full of effective and innovative strategies, the book covers areas such as meltdowns, forming friendships, literal thinking and speaking, and the overwhelming influence of sensory sensitivities. Activities to help explain the child’s behaviour to other students are also included which fosters understanding and acceptance. A ‘Home Link’ section adds vital information about how to work with parents and other caregivers to create safe, loving and fun environments for the child at home and at school. With illustrations throughout, this book will be of immeasurable value to anyone who is working in a classroom setting with children with ASD.